Small homes with big needs require multi-zone mini split heat pump systems. That’s exactly what our sales rep. Peter recommended to Cindy O. in Middle Village during her free in-home consultation. There are many causes that make home temperatures uneven. The solution involves a single outdoor unit and multiple indoor units to warm up or cool specific areas in consideration, without messing up the space. Cindy’s house in Middle Village is a residential, single family home. Very close to other residences on either side, it leaves little walls for the exterior. Resident Cindy reached out to Richair Comfort Solutions to work up a quick fix for hers home. Particularly, a multi-zone heating system that will not mess up the fine exterior. After a quick scan of her residence, we offered her our Mitsubishi 24kBTU multi-zone mini split heat pump system. It included two 12kBTU indoor air units for rooms in need of temperature control. This allows perfect control of heat in individual rooms, while being energy efficient and maintaining the look of interior. 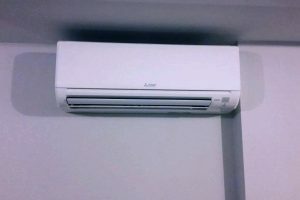 Mitsubishi Electric works exclusively with Richair Comfort Solutions to bring unique ductless comfort systems that provide effective, energy efficient performance of temperature control in any region. Cindy agreed on installing the units in her home the following month. Our trained staff installed the two indoor units in the rooms of her choice. 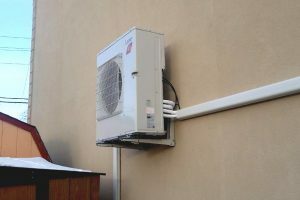 Further, a single outdoor unit was installed on the available wall area. She also purchased a 12-year Extended Service agreement. Finally, Cindy appeared content with the external sleek look kept intact. She expressed her further satisfaction with the system’s quality indoor air, compact design and energy-efficiency on the top of it all. Mitsubishi Electric Cooling & Heating Division’s (MEHVAC) advanced climate control systems have improved customers’ homes and lives for the last 30 years. Ductless comfort system improves comfort while conserving energy and promoting environmental sustainability. Mitsubishi Electric is the third largest manufacturer of cooling and heating systems in the world, and it is dedicated to become the number one provider of comfort systems in America.